Boy, do we have a nice slab of data for you to sink your teeth into today. The 3-year service history of more than 30,000 laptops has been pored over, analyzed, and reduced to gorgeous comparative charts, which you know you’re dying to know more about. We should note, however, that the service was provided by SquareTrade, whose primary business is selling extended warranties, but that shouldn’t completely prejudice us against reaching conclusions on the basis of the presented facts. Firstly, netbooks have shown themselves to be on average 20 percent less reliable than entry-level laptops, which in turn are 10 percent more likely to break down than premium machines. In other words, you get what you pay for — shocking, right? 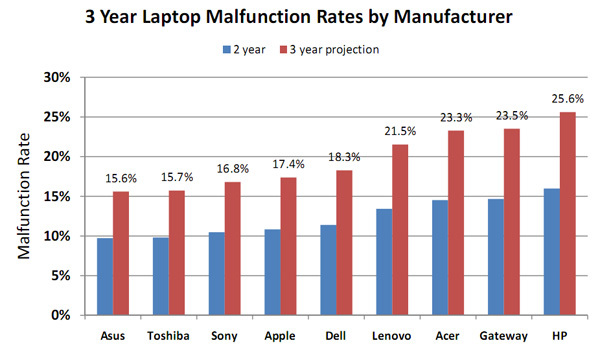 The big talking point, though, will inevitably be the manufacturer comparison chart above: here ASUS and Toshiba (rather appropriately) share the winners’ spoils, while HP languishes in the ignominious last place, with more than a quarter of all laptops expected to suffer a hardware fault of some kind within three years. So, does your experience corroborate / refute this info? Keep it gentlemanly, okay?